This post represents the first edition of a regular feature here. Around the middle of every month, I'll link to new WebQuests that have caught my eye. In future editions, they may well come from all over, but this time I'm going to restrict the list to lessons that have been grown in the QuestGarden. They're not all perfect and maybe not even finished yet, but they all had something interesting about them to make them worthy of a look. First up: Hoosier Who's Who. This is a nice example of using the WebQuest format to enliven the usual study-your-own-state lesson which, let's admit it, is often a snoozer. It turns out that this is a good example of a design pattern, Simulated Interview, that I've had a partial draft of for years but haven't finished. With this example to point to, I'll be adding simulated interview to the patterns list soon. Next, The Confederated States of America. Nice example of the Alternate History pattern. 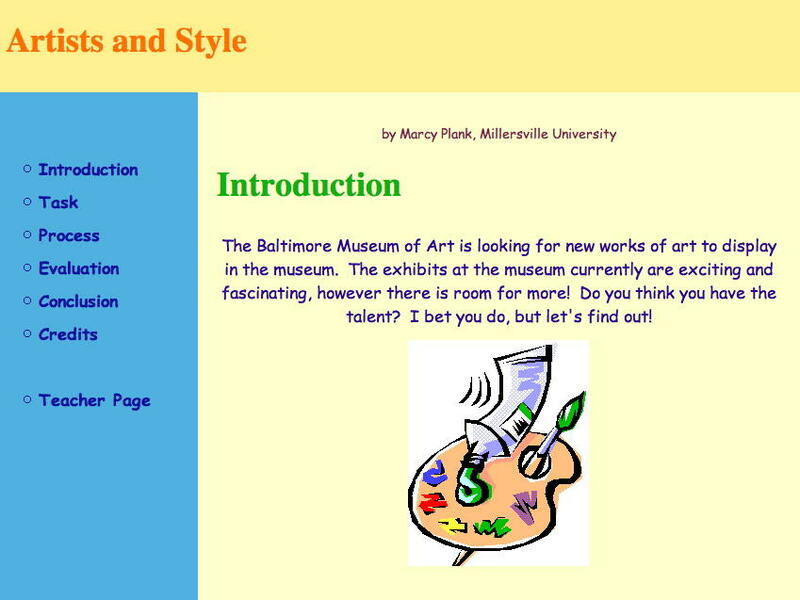 It has a KWL chart and some scaffolding about how to write a term paper. If it just had a little more scaffolding about the main task of extrapolating an alternate timeline, it would be perfect! Artists and Style caught my eye, well... because it caught my eye. It's great to see someone making skilled use of the appearance module in QuestGarden. 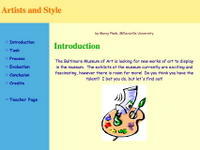 The choice of colors and fonts is spectacular... and it looks like a fun lesson, too. Netiquette: Making a Big Decision has an appealingly dark look. It incorporates role playing as learners grapple with inappropriate technology use in a school setting from multiple perspectives. The Puritans and Punishment: What a Pair! gives students the task of developing a how-to manual for Puritans as they face a number of sticky situations (e.g., a wife who won't obey). It's all done with a light wackiness that makes it fun to read. Junge Mode gets special recognition for having an unusually creative task: design a clothing catalog for teens in German. This should snag the attention of at least some of the kids who aren't normally enthralled by German I. And finally, A Home on Ganymede was a welcome sight. Over the years I've seen dozens of WebQuests which ask kids to design a human habitat on the planet of their choice, which inevitably leads to them making settlements on Jupiter or Mercury or other planets completely unsuitable for homesteading with any imaginable technology. The task is untenable and it makes kids dumber about science than if they'd never done the lesson at all. In contrast to those, this WebQuest does a very nice job of lining up resources and structuring things so that kids would learn about the hard science of making a space colony on a solid body somewhere in the solar system. There are a lot more promising WebQuests coming to life in the QuestGarden. Next month, I'll point out some more. I am surprised that you have some WebQuests of such poor quality on your home page. 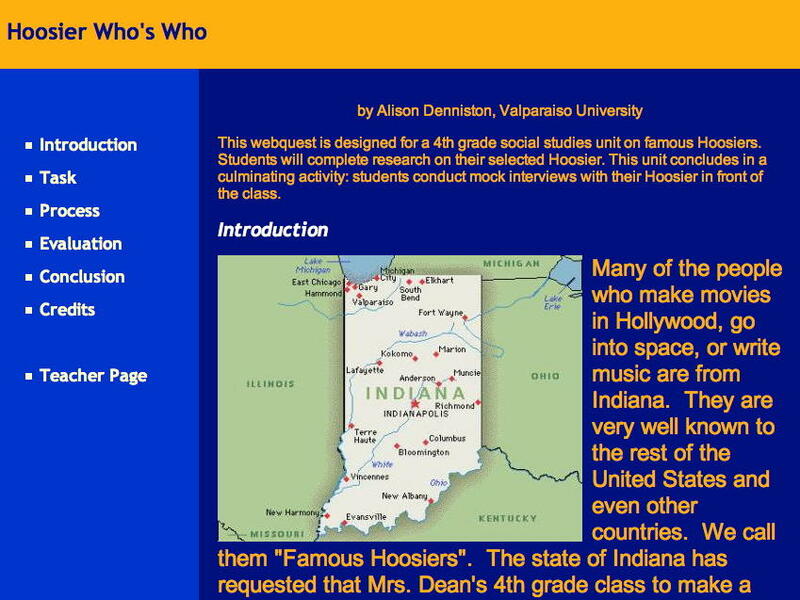 The 'Hoosiers' web quest has very little relevence to 4th grade students, it is teacher directed, and the rubric really measures the listener not the person who is doing the interview. This lacks a product & processs rubric. The confederated states 'webquest' has the one of the worst rubrics ever. Telll me the reliability and validity of creativity - Rocky road, vanilla, chunky monkey. If the standard for Webquests are the format only, then the quality as a tool for learning is suffering greatly. I don't think it is a good idea to feature these on the home page as 'exemplars'. Well as far as we can tell, all these WebQuests were written by humans and that suggests that they're all flawed in some way. I even stated in the article "They're not all perfect and maybe not even finished yet, but they all had something interesting about them to make them worthy of a look." I pointed out what I liked about each, but I didn't mean to imply that each of these was an exemplar in all respects. Dan, if you don't like it, don't look at it. Why should you discourage others? Let's use this as a teachable moment and share what we would change to make these better, not just tear them apart and say they not worthy of using. I plan to share these with fellow technology resourse teachers and as we use them and make changes, we will share with the quest creators. If they choose to incorporate them, fine. Isn't that what we should be doing as "educators"? I am thankful for this "new" site and for the quests posted here. Flawed or not, they provide the info I need for my undergraduate preservice teachers to learn what, why and how. These teachers will not make their own if they cannot see someone else's. I encourage them to move out,do more, be more creative than the ones they have seen here. They try and sometimes succeed. Please keep up the great work. Not all WebQuest are going to be perfect. I think they are great. It adds flavor to learning. I don't expect the webquest to do my job and neither should you. Find the objectives you want to cover; if you don't see them covered in a particular webquest, add to your lesson what is lacking. I use webquest with small groups of students to meet additional needs that they may have. It keeps students from getting bored with the same ole stuff.